The Libertas Choir was established in April 1989 under the auspices of the Women for South Africa movement. 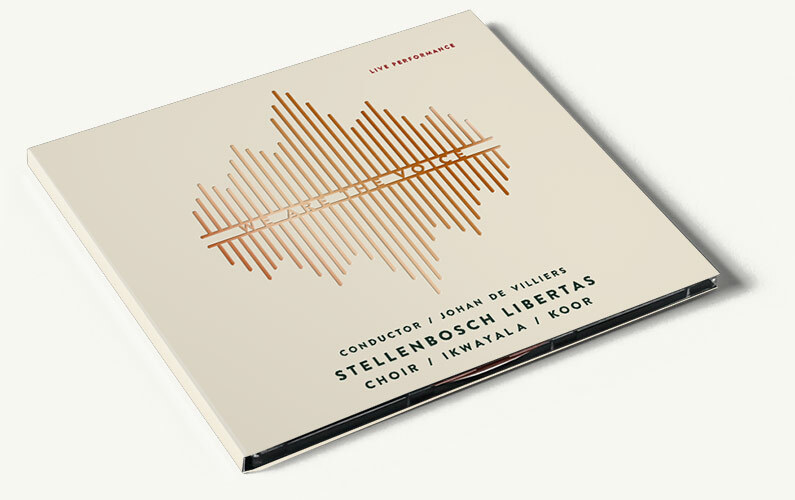 Since 1989, Johan de Villiers has been the conductor and together with his wife, Louwina, as the manager of the choir, the Libertas Choir has performed on world-renowned stages. Its mission throughout remains the fostering harmonious co-existence between the respective cultural communities in our country through choral music, as reflected in the choir’s membership. Regarding repertoire, the choir performs standard a cappella music, as well as commissioned arrangements of traditional and contemporary South African songs. In addition, collaborations with professional symphony orchestras and soloists have resulted, at least bi-annually, in performances of oratoria like Handel’s Messiah, Bach’s Mass in B Minor, the Requiems of Mozart, Brahms and Verdi, Mendelssohn’s Elijah and Karl Jenkins’s Stabat Mater and The Peacemakers. The Libertas Choir has been privileged to have undertaken, on invitation, numerous extensive concert tours abroad. The choir has toured to Germany, the Netherlans, Belgium and the USA, with performances also held in France, Switzerland and England. Highlights during these tours include performances in Westminster Abbey, London; Marlborough House, London, before the Duke of Kent; the Reichstag, Berlin, performing live on German television; De Doelen Auditorium, Rotterdam before Queen Beatrix of Holland; Grossmünsterkirche, Zürich; the Berliner Dom; Riverside Church, New York City; as well as the National Cathedral, Washington DC. In addition, the choir performed on two separate occasions before the German Bundespräsident, respectively Presidents Rau and Gauck, in their official residence Schloss Bellevue, Berlin. In 2016, the Libertas Choir undertook a month-long concert tour of Westphalia, Germany, as guests of the Evangelical Church, which culminated in a performance in the Gerry Weber Stadium, Halle, of Karl Jenkins’s oratorio The Peacemakers, conducted by Johan de Villiers, where the choir formed the nucleus of a 1200-strong massed choir, and with the Nordwestdeutsche Philharmonie symphony orchestra. The choir is, moreover, a regular participant in South Africa’s arts festivals, including the Grahamstown National Arts Festival, the Klein Karoo National Arts Festival, the Stellenbosch University Woordfees, the Greyton Genadendal Classics for All Music Festival, as well as the Hermanus Kalfiefees. Further concerts were presented during concert tours to our country’s major centres of Johannesburg, Pretoria, Durban and Bloemfontein. The members of the Libertas Choir hail from all over the Western Cape, with significant participation from each cultural group. Its diversity enhances the group’s ability towards authentic renditions of ethnic choral music. Weekly rehearsals are held in Stellenbosch, and the majority of the choir’s performances are presented in Cape Town and surrounding areas, often as an outreach to previously disadvantaged communities. The choir performs regularly at high profile functions and international conferences, in the process singing before dignitaries like Presidents Mandela, Mbeki, Sarkozy, George H W Bush, as well as Prince Philip, the Duke of Edinburgh. Throughout its lifespan, the Libertas Choir has received sponsorships, which in fact guaranteed its continued existence on several occasions. Generous financial contributions have been received from Transnet, Mediclinic, Stellenbosch University and Het Jan Marais Nationale Fonds.